google this stuff if you need a chocolate fix. I get so mesmerized by different cooking shows and their amazing ability to make me think that I will replicate the three-tier, made-from-scratch cake they just made. Don't forget the homemade frosting, too. I have made a two-layer, homemade chocolate cake once with homemade chocolate frosting. It was all delicious. It was also for my dad's birthday. On any other day, if I feel like making something but so don't have the energy to become Martha Stewart over night, I turn to my handy box cake mix. In a bundt pan? Fancy! And then for some reason I decided to plop a few dollops of marshmallow fluff on top of the batter. I had this idea that the cake would have rivers of creamy marshmallow running through each slice that was cut. Not so much. Afterward, I thought that maybe I should have buried the fluff pieces inside the batter and that would have made it run through out the cake? No. I think each piece would have just stayed in its place, and that's no fun. But surprisingly, this cake, that came from a box, was really delicious! The marshmallow is what really made it shine...according to my husband. It gave it that toasty, smore-like flavor. I think I concur! For s's + g's, I made a super easy chocolate glaze to drizzle on top. It was quite divine if you ask me! Yes, that's a baby spoon. They can be so handy for small cooking tasks. And for eating yogurt. I love having cookies and cake on hand in the house for when I have a gnarly sweet tooth, but don't really want ice cream and don't want to get off the couch. Try this cake! Easy and delicious= perfect! 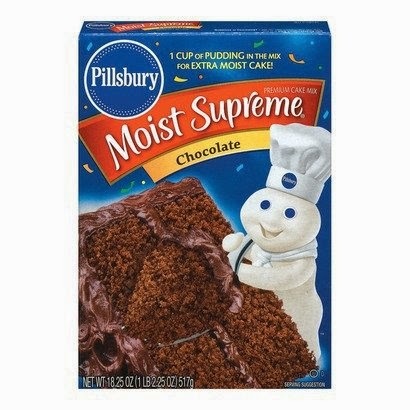 -1 box of your favorite chocolate cake mix. -Follow the box instructions completely. - Melt the chocolate and butter in a sauce pan over medium-high heat until combined. Take off heat and add the cream and water, stir well. Finally add in the sugar and combine well. For a nice, smooth texture, use a strainer and place over a bowl to catch the chocolate. Make sure to wipe the bottom of the strainer to get more of the chocolate. I forgot to do that once. It sucked. Chocolate and marshmallow make such a good team! Enjoy! This box mix recipe should never get a bad rap.